I went a little crazy a few months back buying essential oils. Now I’m trying to come with different ways to use them in my home. 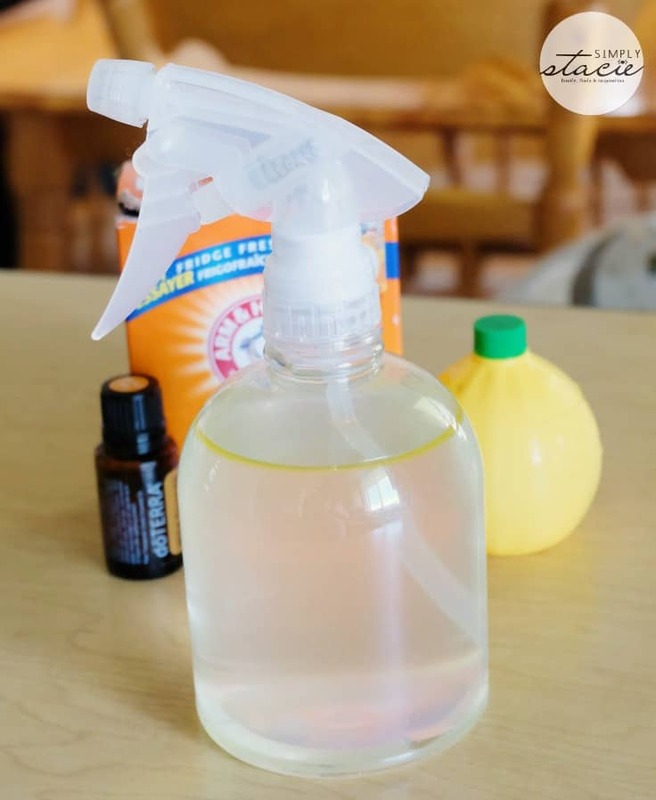 One easy way is making your own DIY Home Deodorizer Spray. With three cats, two kids and a husband, my home often needs a boost of freshness. This spray is super fast to whip up and it takes on the scent of whatever essential oil you use in it. Besides essential oil, you probably already have the other ingredients as they are items used often in the kitchen. 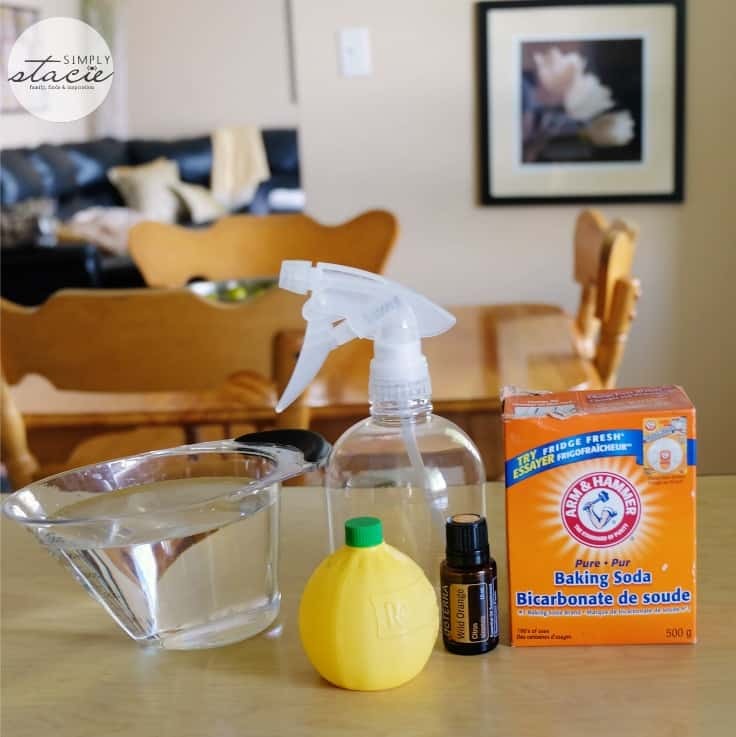 Grab some baking soda from your pantry, lemon juice from your fridge, hot water from your faucet and your favourite essential oil. I used orange essential oil in mine because I love its invigorating scent! The oil will separate from the water so always shake it to combine before you spray. This particular bottle is downstairs in John’s domain. The poor guy is uber smell sensitive so I think this will help freshen things up. I made a pinnable collage with the recipe for you to pin for easy access. For more essential oils reading, check out how to use essential oils around the home. What essential oil will you use in your Home Deodorizer Spray? 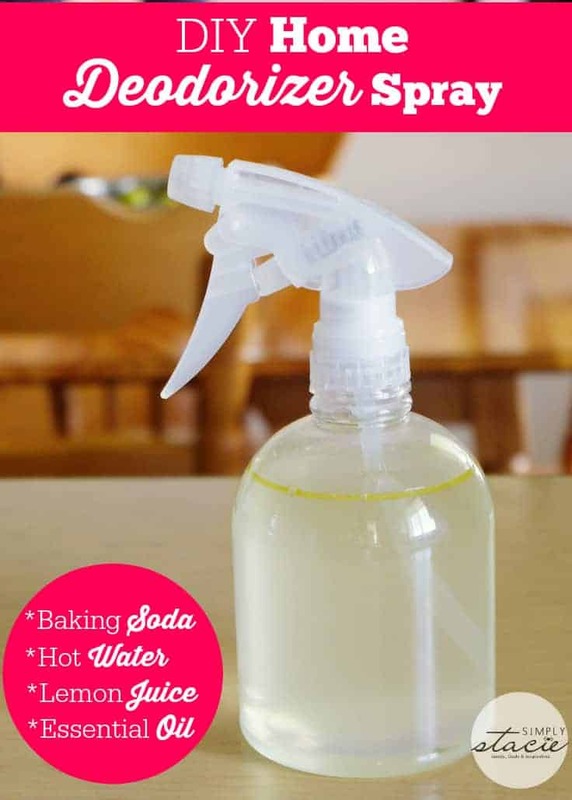 Dissolve baking soda in hot water. Add lemon juice and essential oil. Mix to combine. Store in a spray bottle. Such a great money saving idea. I use a lot of this type of spray around my home and it can become quite expensive. This should cut some of my costs down. I know a man cave that could use this. Thanks for sharing. I love simple, effective DIYs. And love to save some money too. Going to have to try this one out, we can’t use a lot of the commercial spray because of allergies. easy enough to make, I need to get me some orange oil, I can imagine it smells heavenly!! I like this – going to mix it up soon. Awesome idea and very frugal! Plus it’s natural…I really should cut down on the chemical ones I buy and they are already so expensive! Cool I am going to try this with the lavender! had no idea it was that simple I have lemon essential oil will have to make this today! I have heard of this before, but, didn’t realize it was so easy! I will be on the lookout for essential oils now! Thanks! I love this type of spray! It smells great because you can pick the scent and it is SO cost effective. I never considered putting baking soda in it! Have you been able to use it without getting a sort of dried film when you spray it? I would love to know! Every te I have used baking soda I get a weird residue that I need to scrub off. Great idea! I have several bottles of essential oils as well that I am unsure what to do with – this will be a nice way to get some use out of them! I have lemon essential oil that I will use. Thank you! Going to have to try this one out,thanks so much! I think this is great! Going to make this but first I have to find the essential oil. No too sure where it’s sold here but have read so much about essential oils in so many ways to use. I also have a cat and this would be good for around where his litter box is along with the rest of the house. 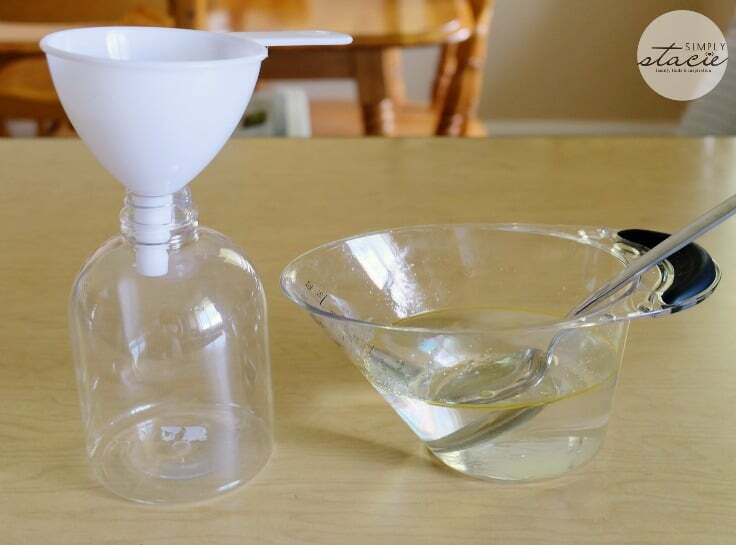 I love making my own sprays… I haven’t used baking soda in them, but have intended to try it. Love essential oils and I love room deodorizer spray! Never thought about making my own, but it seems simple enough, plus there isn’t any harmful chemicals, and I love that. I can’t wait to try this recipe! The house has been all shut up because the A/C is on so I want to give this fresh scent a try. Thanks for sharing and I will be featuring your recipe of this week’s Friday’s Fabulous Five #44. Go check it out on Friday and while you are there share it on this week’s Blog Hop I am sure our readers would love it. II’m not really into the essential oils tho. Tea Tree Oil,Cinnamon Bark Oil, Wintergreen Oil,Thyme Oil, Birch Oil. This is a partial list. . There are also oils that pregnant women should avoid. There are oils that shouldnot be used on babies and children under 3, such as: Oregano, Cinnamon (Leaf & Bark), Fennel, Thyme Red, Citronella, Bay, and Clove. These oils contain higher levels of irritating chemical compounds that could damage the skin, lungs or lead to sensitization. Know your oils! Be aware of how to use them safely and in what quantities. Research and study EOs before using. My husband and I love your deodorizing spray. Thanks for making it a printable recipe. I just made this, and it is great. I used lavender but will be using other oils. I must really put this receipt away and not lose it. Can you spray this deodorizer spray on furniture? I realize you would have to go easy so as to not leave residue but I know Febreeze makes the kind you can apply straight to cloth. Wondering if this is the same? Thanks! I’ve never tried it, but it should be ok!